The Greece crisis has lasted for more than five years and now the meeting with its creditors seems to be lasting for days. The country needs new bailouts in order to pay back its earlier debts. This week Greece might be reaching a decisive point: to stay in the Euro or exit. A look at its banking system highlights the troubled economy of Greece. The signal that banks are facing tremendous pressure can be reflected in the withdrawals that are being done in installments in Greece. The number of customers withdrawing cash from their bank accounts could make Greece face a banking disaster. More than €4bn has been withdrawn last week as per reports. There is a sense of a fear that the country might be facing conversion to a new currency and when that happens, the withdrawal limits of Euros might get restricted. But matters cannot get any worse for the country. The crack between the government of Prime Minister Alexis Tsipras and its creditors: IMF, the European commission and European Central Bank (known as Troika) has deepened with passing time. The creditors believe that in order to restore the long-term financial health, Greece needs to implement budget cuts through pensions and sales-tax increases. On June 17th 2015, Greece announced that it had run out of money and hence could not pay the money it owed to IMF by the end of July. The amount it owed was €1.54bn (approximately £1.1bn). International Monetary Fund (IMF), Christine Lagarde said Greece has long been shown a lot of flexibility by the international institutions and thins time there will be “no period of grace” The IMF and the eurozone government have been trying to keep Greece afloat for a long time now. Around $279 billion has already been given to Greece as emergency loans over a period of five years. June 30 is the date when the eurozone portion of the bailout runs out. According to many, Greece Prime Minister Alexis Tsipras has been caught between the promises of his domestic voters and the commitments he made to the creditors, which he must respect. Greece makes up 2% of the Eurozone economy and whether it stays or exits will be impactful. On June 22nd 2015, the Eurozone partners welcomed Greece’s new reform proposal, which formed the basis of discussion between Greece and its creditors. The proposal highlighted issues relating to savings in pensions that were linked to curbing an early retirement and increasing pension contributions, selective increase in VAT, privatizations, tax hike for high earners, corporate and luxury tax hikes, public sector wages, spending cuts, primary budget surplus, bonds, investment and numerical targets. The bailout reform programme, with less than a week until it expires i.e. 30th June, showed some basic differences between Greece and its lenders. One of the biggest debates is related to the taxes and pensions. For instance, creditors disagreed to accept an introduction of 12% corporate tax on companies with a profit of more that €500,000. Creditors also differ on the Greece’s proposal of raising revenue by raising social security contribution from employers and limiting early retirement. IMF director Christine Lagarde said that the Greek government’s tax plans were not feasible. “You can’t build a programme just on the promise of improved tax collection, as we have heard for the past five years with very little result,” she said in an interview for the French magazine Challenges (in French). She added that she did not want an exit of Greece and if it happened the short-term contagion risks are low in the Eurozone. However, if after Grexit, Greece needed the support of IMF, the latter will be there for any help, she added. But with talks heading a dead end, it is still difficult to fathom whether it will be Greece’s loss or the Eurozone with Greece exiting. This probably is a situation which will be a loss in either case: if Greece exits, it could be a bigger issue for Eurozone and Greece will have to fight its own battles with no common currency nation by its side. The Greeks will find their savings getting devalued and Greece could be in financial and political turmoil. Its exit could also be a leading example to other Eurozone countries that have received bailout packages like Ireland and Portugal. But not only Greece, other Eurozone countries could face the repercussions of Grexit, which could be reflected through the stock markets.If Greece stays in the Eurozone, then it is likely that most of the points in the five page document of reforms by Greece has been more or less agreed upon by the creditors. 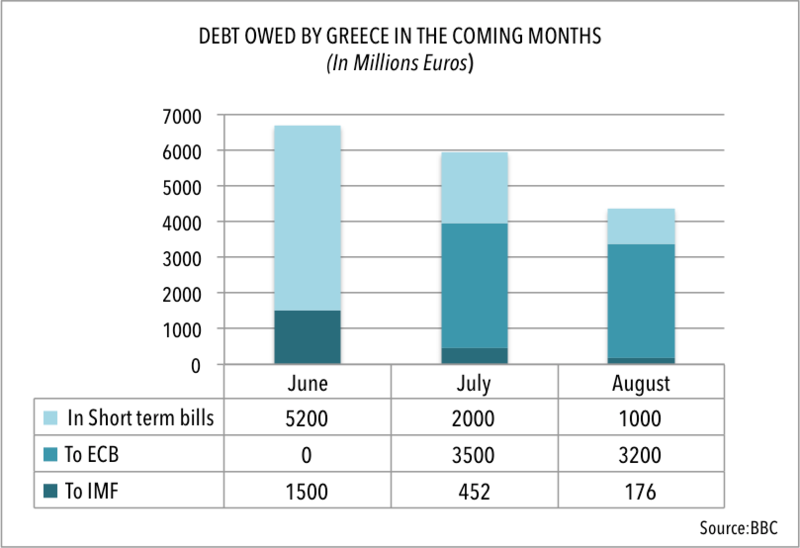 This might not change much of Greece’s debt position, as has been the case in the past few years. Like the Economist magazine says, “The marriage may endure – but even more unhappily than before“. © 2015 Deena Zaidi. All rights reserved. Greece Exit…. end of a nightmare or beginning of one?